There are many other packages that are also worthy of consideration. [http://www.digital-digest.com/software/favc.html FAVC] is a tool like DVD Flick that will convert your video files to DVD with ease - it comes highly recommended. Another similar tool is [http://www.digital-digest.com/software/d2mp.html D2MP], also free. [http://www.digital-digest.com/software/video_dvd_maker.html Video DVD Maker] is free as well, although a fully featured shareware version is also available. There are many other packages that are also worthy of consideration. 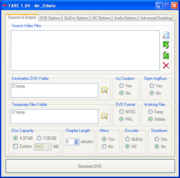 Another free video to DVD tool is [http://www.digital-digest.com/software/d2mp.html D2MP]. [http://www.digital-digest.com/software/video_dvd_maker.html Video DVD Maker] is free as well, although a fully featured shareware version is also available.